Find the best moving & self storage deals in the Niagara Region with MI-BOX. We deliver mobile self storage bins right to your door. Take your time to load your personal belongings and we'll pick it up - storage it for you or move it to your new home. Need longer term storage, no problem. Our containers will be picked up and kept inside our MI-BOX warehouse for safe keeping and accessibility. MI-BOX mobile storage bins can be kept outside on your driveway for easy access. They're great for just about any size moving or storage job. Serving the greater Niagara area, we are your mobile storage solution for Fort Erie, Fonthill, Niagara Falls, Port Colburne, St. Catharines, Welland and more. Moving & Self Storage around the Niagara Region of Ontario just got a whole lot easier. MI-BOX offers the most convenient and affordable options to suit just about anyone. We're locally owned and operated and our business depends on you. You're guaranteed to receive the best service and prices available for all your moving & self storage needs. Mobile storage is simple. It's moving & self storage delivered. That's right, we bring the storage containers right to your driveway or place of business. No more need to rent a truck, or make several trips back and forth from the self storage center. No need to call a bunch of friends to help. Take the hassles out of moving and storage by renting a MI-BOX container today. MI-BOX services the Niagara Region of Ontario. We'll deliver a clean and durable moving & self storage unit when and where you want it. Your MI-BOX container can be kept outside at your location or we can store it in our secured, climate controlled warehouse for any length of time. All MI-BOX containers are delivered with our patented LEVEL LIFT SYSTEM. So you can rest assured knowing your belongings are kept safe and secure. Our Level Lift System keeps your container and contents from shifting by raising and lowering each container horizontally. No roll off trucks or tilting beds when using the MI-BOX Level Lift System. To learn about the MI-BOX advantage and how gentle our delivery system is, watch our videos at watch MI-BOX videos here. So, if you want the service and convenience you deserve at a great price call the best moving & self storage company in the Niagara Region. 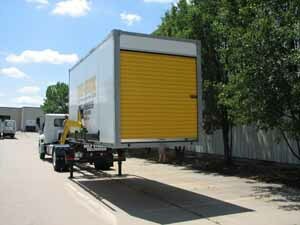 Mobile Storage simply makes moving and storage simple. It is self storage delivered to you. Take your time and load anything you want to move or store. Then, we'll pick it up and move it or store it for you. 1 Call and you're done. MI-BOX Mobile Storage has a patented LeveLift System that gently places the storage unit on any surface - and keeps it level when loading and unloading. Keeping your belongs safe and secure is what we do. We not only service the entire Niagara Region but much of southern Ontario for storage and moving. Moving in the Niagara Region? Then call the most trusted brand in the industry. Call MI-BOX. We're a locally owned and operated moving company servicing customers from Toronto to the Niagara Region in Southern Ontario and the GTA area. Moving in the Niagara Region is simple with MI-BOX. We deliver - You load - We move. Other moving companies cannot compete with our prices or service. We're locally owned and operated so you're guaranteed to get the best prices and service available. Mobile storage from MI-BOX can save you time and money. They're great for all your moving and storage needs. MI-BOX services the Niagara Region of Ontario. We'll deliver a storage container right to your door. Take your time to load your personal belongings and then keep it on your driveway or call us and we'll pick it up and store it for you. MI-BOX Mobile Storage containers are great for home renovations, remodeling, staging your home for sale or taking advantage of a new and improved storage option that maximizes your convenience. MI-BOX storage units are durable enough to be kept outside year-around for any length of time. We also can store your unit in our secured, climate controlled warehouse for any length of time. With MI-BOX you can reduce the stress associated with moving by taking your time packing or unpacking. They're rented by the month so you'll have plenty of time. For the most convenient storage options in the Niagara Region - call us today! MI-BOX is locally owned and operated so you're guaranteed to get the best prices and service available.